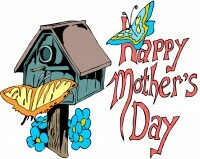 Happy Mother’s Day to all of you… whether you are mothers, daughters, husbands, or sons. From my window, I can see a lot of little mother birds teaching their fledglings how to land on a given perch (or even how to push the other little birds away from the bird feeder!) and I am made aware of how many different mothers there are all around us. Happy Mothers Day to all. I will always be grateful to my Mother. She passed on to me her love of reading, her sense of humor, and her love of family. She died at the age of ninety almost blind but still reading large print books. One thing – these books had to be “decent”. A very happy Mother’s Day to all. I hope every one had a wonderful day!